Roberts R2330 Fiberglass and Luxury Vinyl Tile Adhesive is engineered for the desired tack for fibreglass sheet vinyl and luxury vinyl tile. The pressure sensitive attribute makes it ideal for permanent or releasable installations. Specifically designed as an indoor adhesive that is solvent free with zero VOC. Ideal substrates include concrete, APA rated plywood, and terrazzo. DensShield<sup></sup> Tile Backer is a substrate for floor, wall and ceiling ceramic tile installations and has a built-in moisture barrier which protects tile installations and the wall cavity from the effects of moisture in wet areas such as bathrooms and kitchens. It is the ideal ceramic tile underlayment for new construction, bathroom remodelling, pool areas, and many other high humidity or wet areas. It can also be painted or used in non-wet areas. DensShield panels incorporate fibreglass mats and a moisture-resistant core and are lighter and easier to install than heavy, hard-to-work-with cement board tile backers. DensShield Tile Backer is GREENGUARD listed as microbial-resistant using ASTM D 6329 methodology and has scored a 10, the highest level of performance for mould resistance under the ASTM D 3273 test method. The RobertsTemporary Hard Surface Protection Film, model 70-145, is a clear blue, self-adhering film that provides up to 30 days of protection for all types of hard surfaces including tile, granite, marble, wood and laminate. This product is great for professional builders, remodelers, painters and anyone looking to protect their hard surfaces from damage when exposed to worksite conditions. The 70-145 is also great for parties, open houses, and RVs. R2330 Luxury Vinyl Tile Adh. 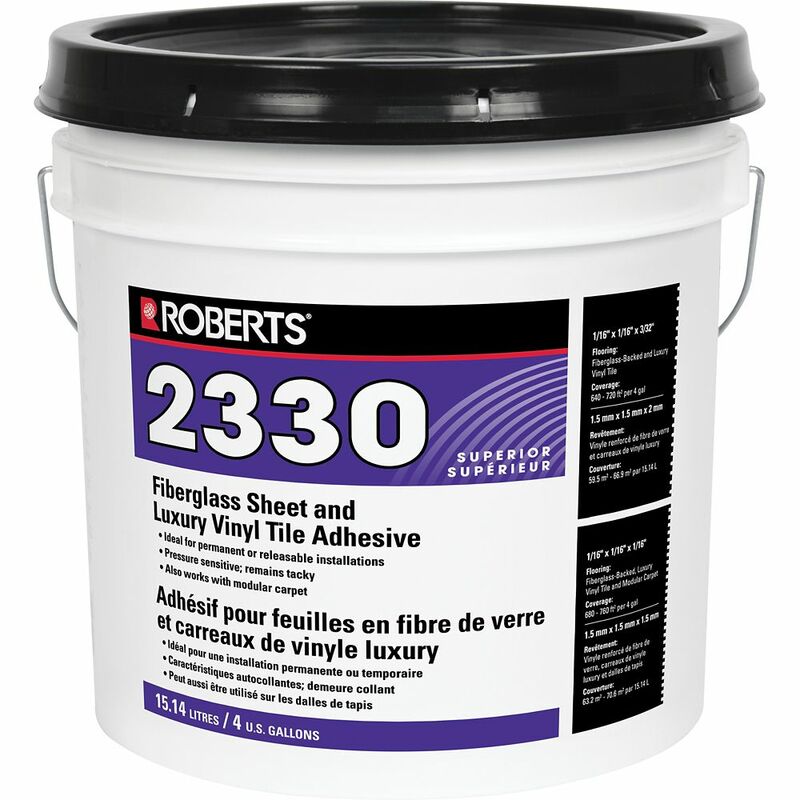 15L Roberts R2330 Fiberglass and Luxury Vinyl Tile Adhesive is engineered for the desired tack for fibreglass sheet vinyl and luxury vinyl tile. The pressure sensitive attribute makes it ideal for permanent or releasable installations. Specifically designed as an indoor adhesive that is solvent free with zero VOC. Ideal substrates include concrete, APA rated plywood, and terrazzo.